The ground below the beams should be stripped of all vegetation. A minimum 150mm void is required below the underside of the floor (this may need to be increased to suit specific ground conditions and local authority requirements) and will require adequate ventilation. 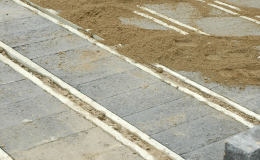 A DPM is advised to prevent concrete seepage and may also be required if the ground below the floor has been excavated below the lowest level of the surrounding ground and will not be effectively drained. 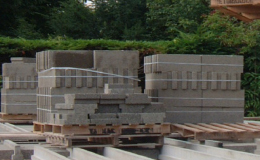 The precast concrete beams and ancillary items are delivered on wagon and drag (rigid with trailer) vehicles with mechanical off-load facilities included. 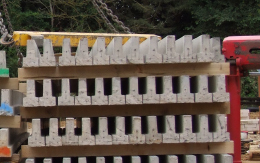 Timber bearers are provided to enable the stacking of the beams and we will colour co-ordinate the beams for each house type/plot if required. 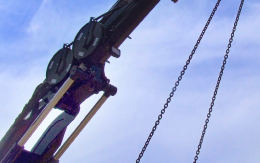 To avoid problems and additional costs at a later date we ask that the number of beams and the ancillary items are counted and signed as received by an authorised signatory. Rigid vehicles can be supplied, speak to our Planning Department for costs. Beams will break or will show signs of excessive camber if not handled or stored correctly. Beams must be stacked on timber bearers on ground that is level and firm, all in line with our stacking procedure guide. 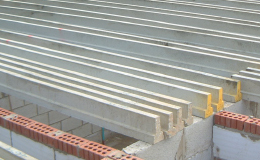 Beams are to be placed on a mortar bedded damp proof course and should achieve a minimum end bearing of 90mm on minimum 3.5N masonry and 75mm on steel. Care must be taken not to overload the floor beams during the construction period. The floor has been designed to withstand light foot traffic. Temporary boards should be used in all other instances. The floor structure once complete has been designed for domestic loadings only, therefore, palleted materials must NOT be placed onto the floor as these can weigh as much as 10 times the design weight. CUBE6 supply full working laminated approved drawings together with installation guides with every delivery to site to ensure that site have the latest information. The drawing will clearly show the start point for the layout and the length of the beam to be used in each area. 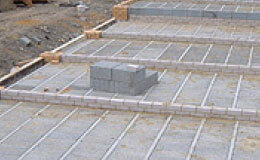 Slip bricks are supplied to be placed between the beams where walls built over and must be bedded. 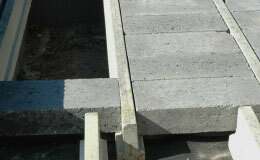 Flooring blocks can weigh from 600kg/m3 to 2000kg/m3, manufactured in sizes from 440 x 215mm to 640 x 520mm. They must achieve a minimum 3.5N/mm2 with a transverse point load capacity of 3.5N. The following list is just a guide of what is available but is by no means exhaustive. This is an important part of the installation process as this will tie the beams and blocks together. This is achieved with a brushed grout with a minimum mix ratio of 1:4 cement /sharp sand, onto thoroughly wetted floor. This will ensure that the floor components are structurally sound. 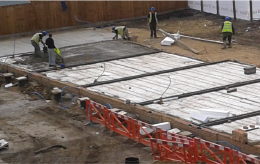 Garages require a minimum C30 concrete topping applied directly to the floor, with a minimum A142 steel mesh. Void ventilation is designed in accordance with Building Regulations Part C. Ventilation openings should incorporate suitable grilles which prevent the entry of vermin to the sub-floor but do not resist the air flow unduly. Our telescopic vents are ‘Z’ shaped to be used where a cavity wall exists. The vents are capable of extending to 8 courses vertically and allow for cavity walls upto 350mm wide. 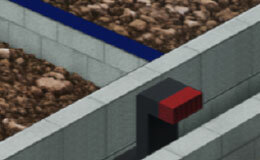 Plastic air bricks are supplied in 4 colours (red, buff, brown, black) which offer 7600mm2 of free air flow. 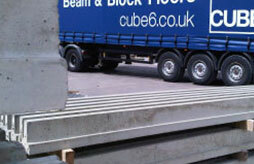 Where a heavy point load is to be applied to CUBE6 beam and block flooring i.e. garages, it is recommended that the floor should have concrete of minimum grade C20 reinforced with an A98 mesh to distribute the load.